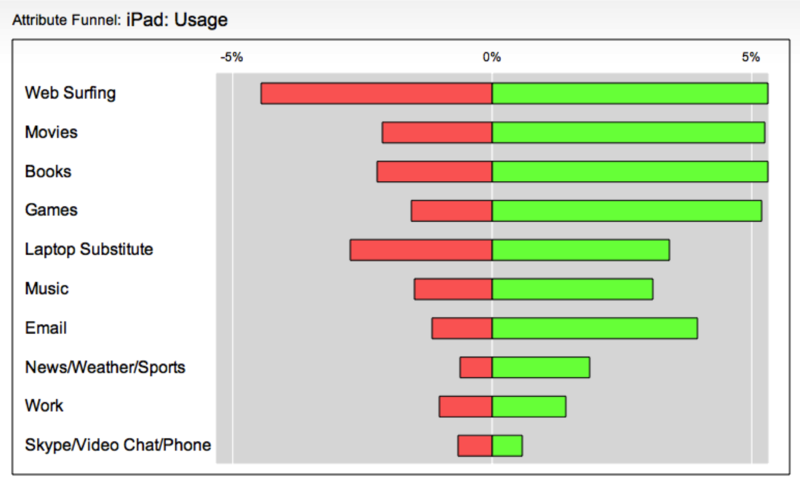 This just in, Verizon iPhone customers are happier with their experience than AT&T iPhone customers. While not a big surprise, the surprise is in just how big the difference is! starting in Q1 of this year. 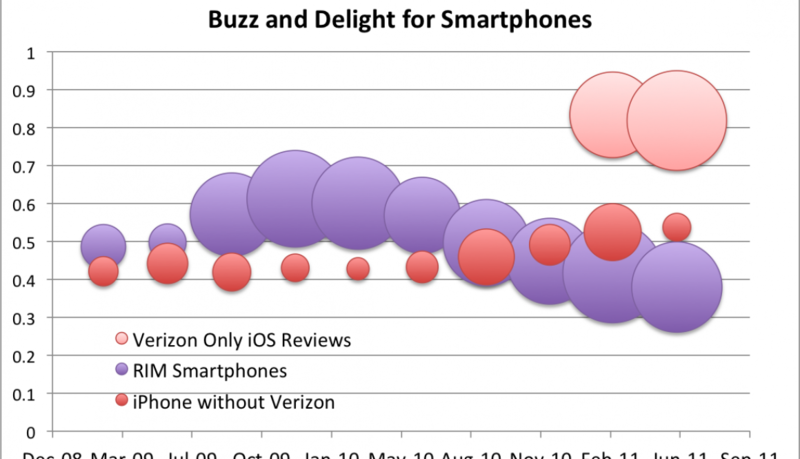 After digging deeper, we found most of the reviews were coming from Verizon iPhone users. It turns out that AT&T does not allow customers to review iPhones on their site. Because it is the only device you cannot review, we speculate that something in the Apple/AT&T agreement precluded AT&T from publishing user reviews on their site. 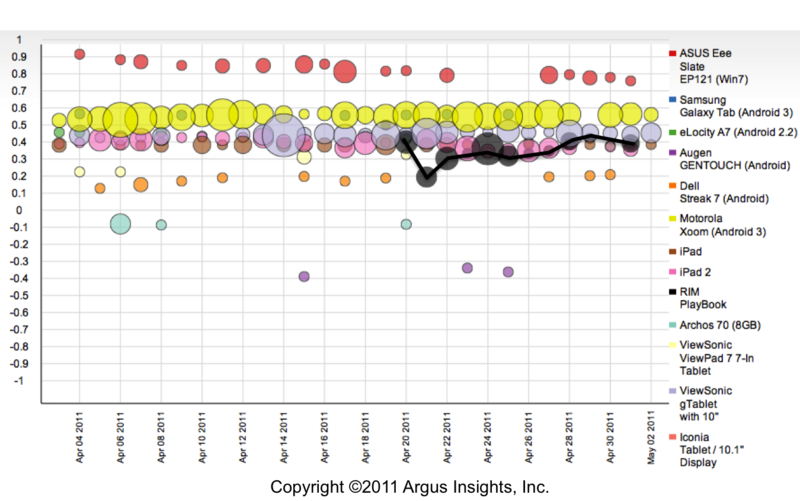 To ensure we were comparing apples to apples (or in this case Apples to BlackBerries), we pulled the Verizon data from the iPhone data so we would use the same data sources throughout the analysis and for both markets (turns out the results are the same with the Verizon data in or out). 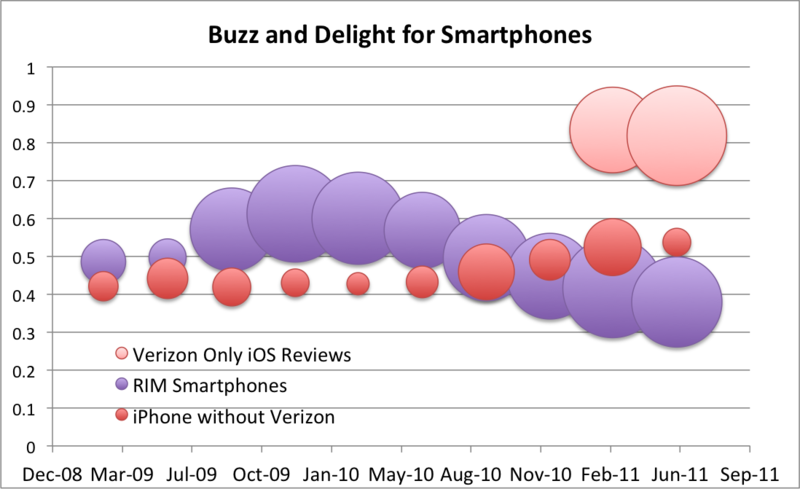 We were shocked to find how much the iPhone delight scores dropped when we pulled Verizon from the mix. After plotting the Verizon data separately, you can immediate see why that was the case. 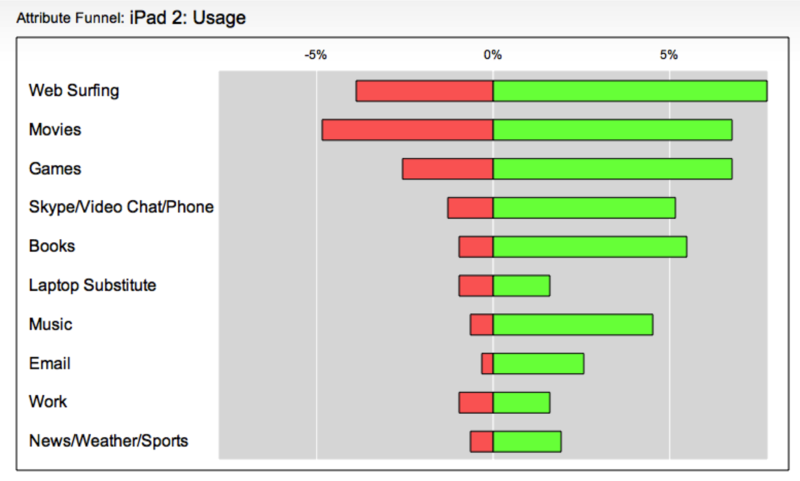 The Verizon iPhone user delight levels were roughly 80% higher than the baseline iPhone users. iPad has its nose in the Enterprise Tent. Asus is already having tea inside. We recently did a post on the rapid consumerization of the enterprise, starting by looking how the semiconductor industry traded the boom and bust cycles of the enterprise market in for the more “consistent” cycles of the consumer market. Now we are seeing consumer grade tech invade the enterprise like a locust swarm. This latest revolution has been driven by Apple and the iPhone. While Blackberries remain the badge of “serious” business, the iPhone rapidly was snatched up by CEO and janitors alike, rapidly becoming the badge of “cool” business. The sprouting of hundreds of walled gardens of Apples inside the corporate firewall has driven CIO’s sleepless and insane as they struggle to maintain the paradoxical duality of Sarbanes-Oxley mandated information access & control paradigm cohabitation with the “let’s mix our sales forecast numbers with Angry Birds high scores” world of iPhone and Android devices. We’ve seen Apple and Google both make concessions for the enterprise customers attempting to extend the consumer lifestyles into the “business formal” parts of their day. But this was smartphones, devices that worked mainly as conduits to colleagues through voice and email. Occasionally users would attempt to review and mark up documents on the tiny screen. Once finished this lilliputian task, these users would immediately dial-up their optometrist to be treated for eye strain. in the enterprise overflow the carefully built dykes of security anytime soon? Yes they will. Our information on tablet usage is showing an increasing number of iPad and iPad 2 users are leveraging these constantly connected windows of wonder for their day jobs. As you can see in the Attribute Funnels below for the iPad and iPad2, “work” ranks as the 9th most common activity users mention as they share their experiences with others. What’s interesting is that, even between product generations, roughly 5% of all iPad/iPad2 users are utilizing it for some sort of professional use. Now contrast this with the ASUS Eee Slate. Users of this trim little Windows 7 device rank professional activity as their top usage, with over 12% of users making mention specifically of work activities. Remember our nervous CIO’s from above? 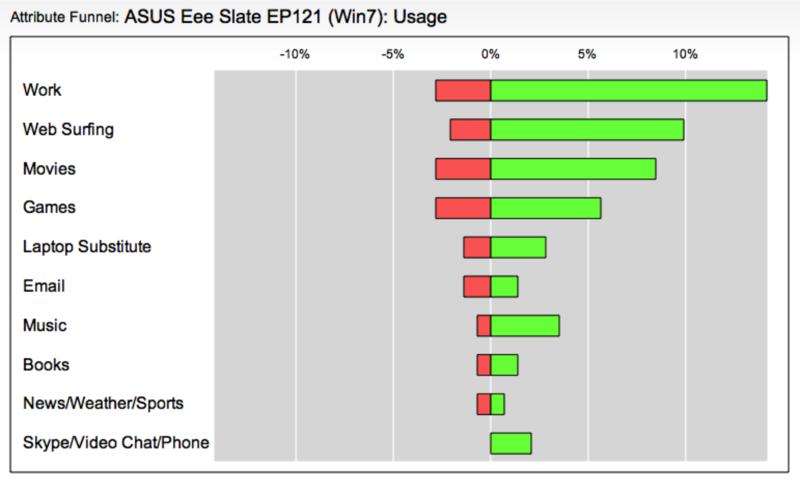 They love the Eee Slate. It’s an OS they already support, able to run applications they already have control over. This is a product that fits needly into the existing corporate ecosystem and this message comes across from the users. So the question on the table is, given the increasing availability of enterprise/CIO friendly tablets, with the nose of the iPad’s eventually make it all the way into the tent of the modern enterprise or will employees be increasingly asked to leave their toys at home. Rumors of the PlayBook's demise are grossly exaggerated! Here at Argus Insights, we’ve been closely following the Tablet Market since the iPad2 launch. And by “following” we mean digging through the market’s response to the growing portfolio of tablet options. How deep, you ask? Imagine the Hubble Telescope turned so that’s it’s focused on the Tablet Market instead of distant nebulas—that’s how deep. Like digging through Hubble data, we’ll start with a map of the current Tablet universe. 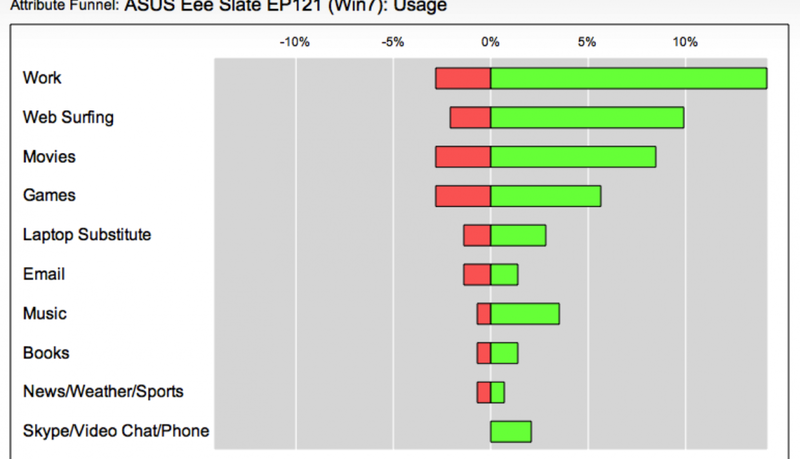 Below is our latest Buzz and Experience Landscape chart for the Tablet Market. 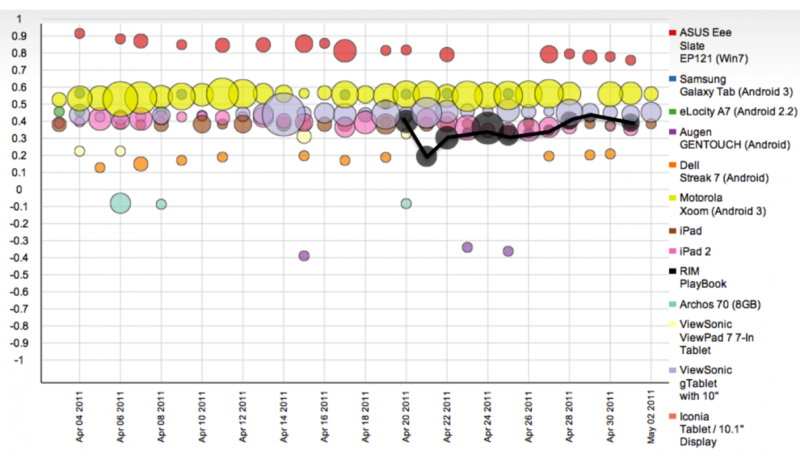 Notice the dark sparkline for PlayBook activity in the market. After a rocky start, it’s recovering as users get their hands dirty with the device. The PlayBook is still trailing the Xoom and the gTablet from a customer delight perspective, but it’s providing a stronger showing that pundits initially gave it credit for. So what’s catching? Could the architecture decision for PlayBook-to-Blackberry tethering mean that Jeff Hawkins idea behind the Palm Foleo has taken hold? Here at Argus we speculate that consumers desire to pay once for bandwidth across their mobile devices instead of separately for each gadget. Let’s face it, it’s rare you have your tablet without your phone and, in that context, tethering makes sense. We’ll add an analysis thread on tethering as this story continues to evolve. er feedback—real insights you can act on. As with most tablets, Websurfing is the primary use for the PlayBook. 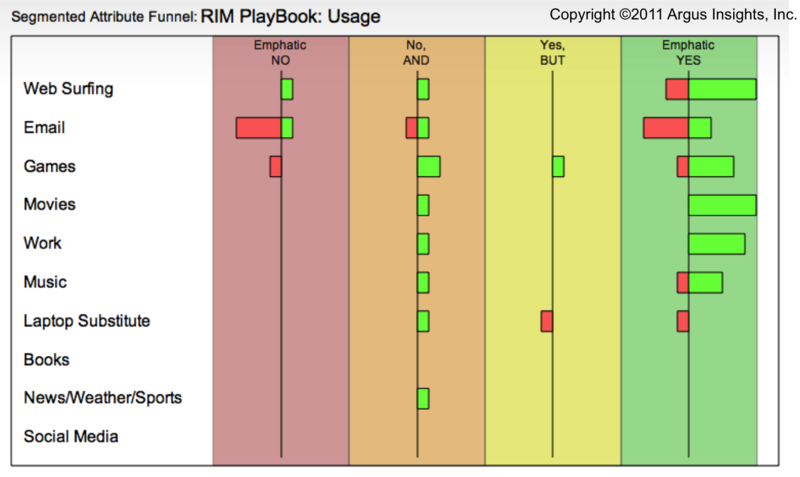 Where Playbook diverges from iPad and others is the heavy use for email—not a surprise given RIM’s enterprise roots. What’s interesting here is how annoyed users are with email functionality. RIM users are passionate emailers and are connoisseurs of email clients, so their expectation of PlayBook email would be high. When we break this down by Sentiment Segments in the Segmented Attribute Funnel, new patterns of love and hate manifest themselves. The Segmented Attribute Funnel splits out the analysis by segments of sentiment, broken down into four areas, Emphatic NO (Curmudgeons), Emphatic YES (Lovers), No AND (Keys to Satisfaction), and Yes BUT (Source of Delight). As you can see, even the Lovers don’t love the email client. Even those that don’t care for the PlayBook experience still find the web-surfing to be compelling. 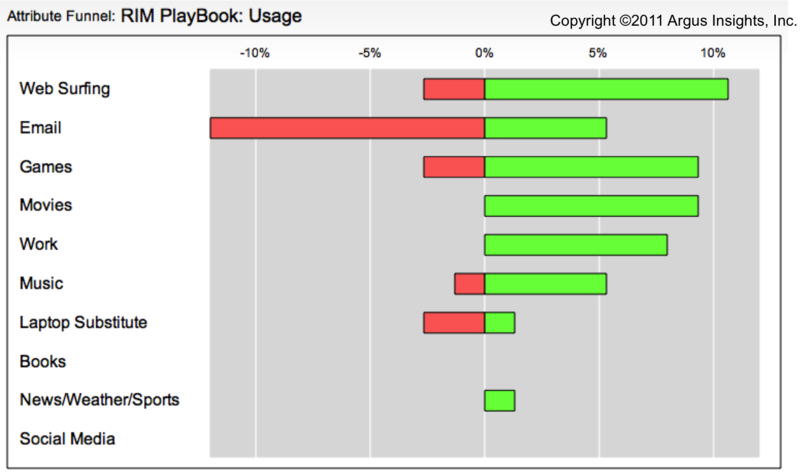 With only two weeks of data and a small sample size, we can already see how the PlayBook experience is trending. Overall, the device is working as expected in most areas (with the exception of the email client and functionality as a laptop substitute). Looks like RIM, contrary to popular belief, has delivered a winner. Like the radically different BlackBerry Storm, the PlayBook has a learning curve. For the users willing to make the climb, the new tablet is delivering (mostly) on it’s promise.